“Little Russia,” as fondly called by the locals, Kaliningrad is a history buff’s heaven that dates back to the 13th century. Established by the Teutonic Knights, the city was chosen as the capital of East Prussia and the Duchy of Prussia. Later, it went on to become a part of the German Kingdom, followed by the USSR and finally Russia. Step in to a last minute flight to Kaliningrad and discover the rich chronicles of the capital of the Russian Province of Kaliningrad Oblast. Nestled between Lithuania and Poland, Kaliningrad is blessed with the splendid backdrop of a scenic coastline. The landmark city gates, lovely neighborhoods, world-class museums, well-preserved historical sites and gorgeous parks; this Russian city makes for an idyllic destination for all kinds of travelers. Kaliningrad is so deeply immersed in history that almost each corner in the city has its fair share of notable past. Though the city appears very pleasing to the eyes today, it had to go through its own struggles. Much of the city was demolished during the Second World War only to be restored post 1945. Originally referred to as Königsberg during the German Empire, the city boasted an imperial architectural scene and a cosmopolitan vibe. 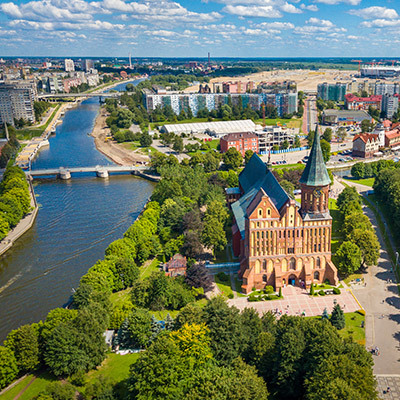 Today, it lures many voyagers to book airline tickets to Kaliningrad who come here to spend some time in the serene ambience of the city while exploring some spectacular attractions at the same time. World Ocean Museum - The World Ocean Museum is home to the legendary submarine— B-413. The watercraft measuring nearly 300 feet in length and equipped with 22 torpedoes could stay under water for up to 120 hours. It played a crucial role in the “Cold War” between the USSR and the United States of America. Put up for public viewing in the museum since the year 2000, it is the prime highlight of the museum along with the research vessel “Vityaz.” The museum also educates its visitors by providing a lot of captivating information relating to the artifacts displayed here. Königsberg Cathedral - Sitting pretty in the center of Kant Island amidst the scenic backdrop of the Pregel River, the cathedral traces its roots to the 14th century. The church consists of 2 chapels— a Russian Orthodox Chapel and a Lutheran Chapel. The cathedral is widely acknowledged for its striking artworks and embellishments featuring baroque style design. A particular highlight is the Red Bird sitting atop the cathedral that resembles a Phoenix rising from the ashes. This in particular reflects the turbulent history that the cathedral had to go through during the two world wars. The cathedral is also home to the Kant Museum and Wallenrodt Library from the 1600s that once boasted an astonishing collection of more than 10,000 titles and was later restored in 2005. Fort 5 - King Frederick Wilhelm III - Fort 5 is known for its amiable atmosphere. You may either rent a car or take the trolleybus no. 1 from the city center to reach the site. Once you’re here, check out the underground tunnels and the remaining rooms that serve as a testament to the heavy-duty construction of the fort that was built to withstand massive scale of destruction. The fort was originally opened in 1979 to be a museum. Later, the museum was included as a part of Kaliningrad Regional History and Art museum in 2010. Albrecht of Brandenburg monument - Born in 1490, Albrecht Hohenzollern has been dubbed as the Father of the state of Prussia. He was a prominent supporter of secular schooling. To his noble intentions, he also founded the Albertina University in 1544. He died in the year 1568 and his body was kept in a tomb in the Königsberg Cathedral. In 1891, a bronze statue built in his commemoration went missing and was found after some time, during restoration, right in front of Kant’s Tomb. There is another statue of Albrecht in Poland at the Malbork Castle. Baltic Fleet Memorial - This imposing naval monument was constructed in the year 1978 in the commemoration of the sailors of the Soviet Baltic fleet involved in the East Prussian Offensive. Equipped with a 60 feet long “Komsomolets” torpedo, the monument was refurbished in 2010. You will also find an epithet on the site that reads— “1945: The Homeland Remembers”. You may, without much difficulty, find several hotels in Kaliningrad in proximity to the site. Kaliningrad feeds the wanderlust souls with its myriad attractions. There is no spot in the city that doesn’t pique the interest of its visitors. So, start looking for the best flight deals and the moment you chance upon a cheap flight to Kaliningrad, leave everything and take a sojourn to this Russian beauty.